Westfield Shopping Center, Olympic Park - Ringtail Emergency Lighting. The £1.8 billion Westfield shopping centre is one of the largest legacies of the London 2012 Olympic Games. Opened in September 2011 the Westfield complex is Europe’s biggest with 1.9 million square feet of retail, residential, commercial and leisure space, 280 retail outlets and 50 eateries. As well as being Europe’s largest shopping centre, Westfield London has been designed to incorporate the latest innovative and sustainable technologies into every aspect of operation. Ringtail’s brief was to present high quality DALI addressed units exclusively for use in the emergency lighting system. In public places such as shopping centres, the majority of persons are unlikely to be familiar with the layout; therefore it is necessary to provide strategically placed emergency exit units permanently indicating the escape routes along with adequate luminance in special locations as specified in BS EN 1030: 1999 / BS5266 – 7 1999, Clause 5. In September 2011 the design, operation and maintenance of Westfield resulted in the centre achieving a BREEAM rating of “excellent”. The use of natural light, effective insulation, high efficiency lighting and heating and cooling control ensures that Westfield is at least 10% more energy efficient than required by Building Regulations. All Ringtail emergency lighting units had to possess integrated control and diagnostic capabilities. Units also had to adhere to strict efficiency codes without compromising performance and ensure that all legal requirements were fulfilled. Ringtail Lighting’s MP8, ES8 and ESW units have been supplied for use on all emergency exit routes staircases, corridors, final exits and communal atriums in the complex. Our MP8 and ES8 units, placed along all indoor emergency exit routes, have been supplied with DALI technology designed to meet the specifications of the Westfield lighting system. A DALI addressed system will perform the necessary self-diagnostic tests in accordance with BS5266. Each luminaire reports back its own test results to the central panel or computer; if there are any malfunctions found with an individual luminaire, the specific fault is highlighted. MP8 units have been supplied in a chrome finish, in keeping with the centre’s décor and interior design. Metal was specified over other materials because of its durability, aesthetics and ability to answer strict performance demands. Our ESW units were placed on all final exits. Protected up to IP65, the ESW is a tough waterproof unit and is ideal for exterior use. Supplied in a Maintained option the ESW ensures the correct levels of light are reached at all times. The inclusion of a number of DALI addressable and maintained units into the lighting control system has made an extremely complex system, relatively simple and easy to manage. 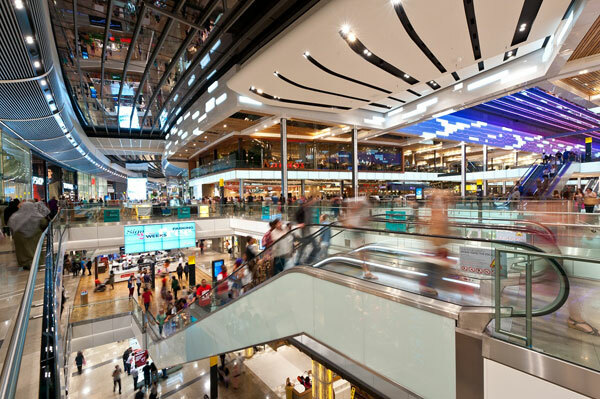 For Westfield, emergency lighting units supplied by Ringtail have delivered on all counts – from an operational, diagnostic and energy management perspective.